The Coast Guard, which previously failed in its attempt to go live on Epic, will instead implement Cerner as part of the DoD’s MHS Genesis project. 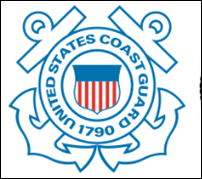 The DoD will revise its contract with primary contractor Leidos to incorporate the Coast Guard’s requirements. It says it won’t know whether the contract cost will increase until that work is finished. The Coast Guard spent five years and $60 million – vs. the original budget of $14 million – trying to bring Epic live, only to give up and go back to paper after retiring the systems it was supposed to replace in early 2016. From Chance the Rapper: “Re: VA’s VistA. They should keep it, according to this poll.” The HIMSS-owned rag’s poll suffers from a multitude of problems that make its “keep VistA” conclusion useless beyond its intended clickbait purposes. Polls covering a detailed technical topic that generate a small number of responses from unvetted participants are pretty much worthless and certainly not something I’d splash all over social media. Most sites that run health IT polls intentionally hide how poorly they were designed and thus how questionable their results are. From Firehydrant: “Re: Ascension. Cerner is possibly a victim of Ascension incompetence and political back-stabbing. Ascension IT has eliminated 20+ CIOs and 30+ directors as they drive strategy from St. Louis. They’re focusing on talent from Express Scripts. A recent all-hands webinar was marred by heckling staff using pseudonyms, with executives threatening to eliminate chat tools if the staff can’t be trusted.” Unverified. From Someone Formerly of NextGen: “Re: NextGen. Tweeting to hire new talent. Two days after they announced their $300 million credit with JP Morgan, they laid off 60 people, some of them key individuals in charge of implementing the new vision of NextGen. Depending on how they recovered from last year’s mass exodus of veteran sales professionals, this puts them at a 2-3 percent reduction of workforce.” Unverified. But I’ll say in the company’s defense that layoffs are common in health IT (especially the publicly traded ones like NextGen / Quality Systems) and companies are always cutting back headcount in some areas while expanding in others. It’s too bad that employees assigned to a particular project are often let go, but that’s the easiest way out for executives. QSII shares have lagged the Nasdaq for years, shedding 23 percent in the past five years vs. the Nasdaq’s 116 percent gain. The only QSII executive who’s been with the company longer than three years is the HR VP (who’s also the only woman among the six executives). CEO Rusty Frantz said in last month’s earnings call that “85 percent of our effort is focused on monetizing our existing client base” and that “the replacement market’s a tough place right now,” with obvious hope placed on the August 2017 acquisition of physician practice analytics vendor EagleDream Health as well as the new sales force he brought in. 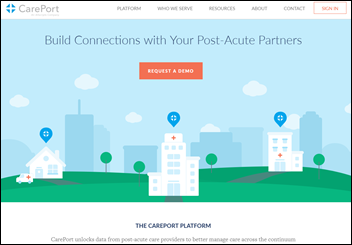 Allscripts repositions its care and referral management system (the former ECIN, relabeled as Care Management) under CarePort, the outcomes technology vendor it acquired in October 2016. I interviewed CarePort co-founder and CEO Lissy Hu, MD in February. Healthfinch raises $5.7 million in a funding round. Theranos lays off most of its remaining employees following SEC fraud charges and ahead of a likely bankruptcy filing, leaving around 20 employees left vs. the 800 it had in late 2015. HealthlinkNY selects the Quality product of Diameter Health, which is certified for more of NCQA’s e-clinical measures than any other firm. 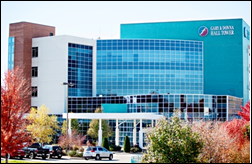 Freeman Health Systems (MO) will conduct an extended pilot of Mobile Heartbeat’s MH-CURE secure smartphone platform after completing a pilot in Freeman Hospital West’s cardiology department. 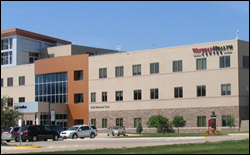 Waverly Health Center (IA) will replace Allscripts Paragon with EClinicalWorks. Omnicell hires Scott Seidelmann (Candescent Health) as chief commercial officer. He founded radiology workflow technology vendor Candescent in March 2015 and sold it to Envision Healthcare in August 2017. Dennis Shin (The Advisory Board) joins oncology precision medicine software vendor Syapse as chief commercial officer. Phoenix Children’s Hospital (AZ) reports that its use of Medicomp’s Quippe Clinical Documentation has increased clinician productivity and enhanced documentation quality while nearly eliminating its $1 million annual transcription costs. 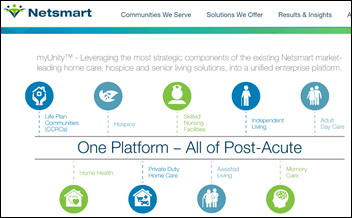 Netsmart announces MyUnity, a cloud-based EHR for home care and senior living providers. It’s being demoed this week at the company’s CONN18 user conference in Phoenix. 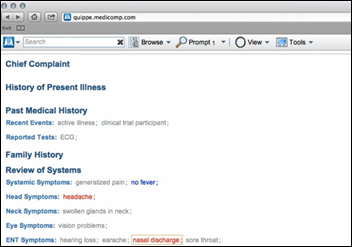 Phynd integrates Healthwise’s clinical taxonomy into its Provider Information Management solution. AMA and its Integrated Health Model Initiative launches an interoperability challenge – sponsored by Google – that calls for ideas on: (a) how patient-generated data can be moved from their mobile devices into physician workflow, and (b) how physician-generated data can be sent back to the patient’s device for action. Prizes are offered, but in the form of one-year Google Cloud credits instead of cash. Residents from anywhere in the world can participate except those countries labeled by the State Department as sponsoring terrorism (North Korea, Iran, Sudan, and Syria) and those in Canada, Mexico, and Brazil (I’m not sure how they got on the wrong side of the AMA to be lumped in with terrorist countries). Video visit provider Doctor On Demand will enhance its lab ordering services via Change Healthcare’s network, which will allow patients to work with their doctor to choose the closest in-network lab location. Inovalon launches services for clinical data extraction and natural language processing for its value-based care platform. 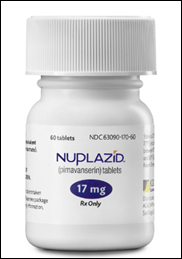 FDA caved to pressure from emotional patients and families two years ago in approving the expensive new drug Nuplazid for Parkinson’s diseases psychosis despite several studies that showed it ineffective at best and dangerous at worst. Now the adverse events reports are piling up. CMS issues its 2019 insurance exchange rules, with Administrator Seema Verma loading her quotes and tweets with political derision in referring to “the harmful impacts of Obamacare” and “the previous Administration’s one-size-fits-all approach.” States will be given more flexibility in defining Essential Health Benefits, insurer risk adjustment will be tweaked, states will be allowed to request a lower Medical Loss Ratio for insurers to stabilize their markets, and the SHOP insurance program for small businesses will be moved from the exchanges to individual insurance agents. Verma said in a tweet that insurance premiums doubled in states that participated in the federal exchange even as fewer choices were offered, requiring regulatory reform. Facebook versions through 2014 allowed companies to create quizzes that would give access to the information of the quiz-taker’s Facebook friends even though those friends hadn’t given permission and weren’t alerted. Facebook learned from a newspaper story that a personality quiz developer had shared user information with Cambridge Analytica, after which that developer was banned and forced to delete the data. Just two weeks ago, the company found out that a feature that allows looking someone up by their phone number and email address “was abused” by linking public Facebook information to their phone number. Access to user data will be removed for apps that a given user hasn’t run for three months. Apps will only be able to see user name, profile photo, and email address. Users will see in their News Feed which apps they’ve authorized to use their data and whether Cambridge Analytica extracted their information. Facebook will restrict use of some APIs, such as for groups and events. Advertisers will have to confirm their identity and location before running political and issue ads. Zuckerberg vows that “advertisers and developers will never take priority” over “bringing the world closer together” even though they are Facebook’s customers. Zuckerberg had to explain several times that Facebook doesn’t sell data, it only uses it to target ads. Pressed hard on whether he would support a law requiring that users of any web service opt in before their data is used, Zuckerberg finally said yes. As someone tweeted, above is a suddenly relevant 2003 article from The Harvard Crimson. A Black Book survey of 19,000 physician practices finds that small-practice doctors who use specialty-specific EHRs are the happiest EHR customers. Leading the satisfaction pack are AdvancedMD, Drchrono, Epic, NextGen, Netsmart, Modernizing Medicine, and SIS Amkai. Other satisfaction leaders are T-System EV (emergency medicine), Praxis EMR (family practice), Surgical Information Systems (general surgery), DocuTap (urgent care and occupational medicine), and PointClickCare (geriatric medicine). The survey also found that while most practices regularly use basic EHR capabilities, those with six or fewer physicians rarely use electronic messaging, clinical decision support, interoperability, and patient engagement. Mayo Clinic offers voluntary separation packages to 400 transcriptionists as technology replaces them even before it goes live on Epic. Scientists propose defining Alzheimer’s disease by biological signs that can be observed 15-20 years before the first dementia symptoms are seen, a change that will greatly increase the count of people with the disease. They’re hoping to improve outcomes by starting treatments before brain damage has occurred. The researchers hope to get more patients enrolled in pre-symptomatic stage studies, but don’t recommend that people get tested on their own since there’s no available Alzheimer’s treatment. A Health Affairs blog post says that only 15-20 percent of Baby Boomers will be able to afford the long-term care services they will begin consuming on a massive scale in the next 10 years. It adds that Medicaid will be stretched as the default insurance for half those people, also noting that less-wealthy Boomers will have to get used to the idea of sharing rooms in old facilities. This is the kind of careful editing that makes me comfortable sending $3,500 off to Pune to buy a Global Hospital Information Systems Market Report. Agfa HealthCare acquires French e-health specialist Inovelan. Arcadia will host Aggregate2018 April 18-20 in Boston. Forbes names Direct Consulting Associates to its Best Professional Recruiting Firms of 2018. The Hospital Association of Southern California partners with Collective Medical to bring members cost-saving identification and support of frequent ED utilizers. CoverMyMeds will exhibit at the AAP Annual Conference April 12-14 in San Diego. Meditech certifies infrastructure provider SYSDBA as the only systems integrator for Africa and the UK. Spok executives will participate in upcoming events that include AONE, the AMDIS PCC Symposium, and the AHA Leadership Summit. Dimensional Insight will exhibit at the ACO & Payer Leadership Summit April 12-13 in Palm Beach, FL. Ellkay exhibits at the ACMG Annual Clinical Genetics Meeting April 10-14 in Charlotte, NC. InstaMed will exhibit at the Office Practicum User Conference April 12-14 in Orlando. 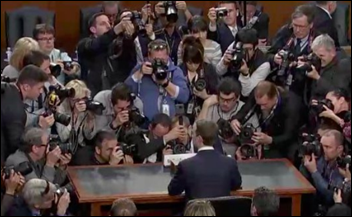 It pains me to defend him, but from from hearing more of the sequence on the radio, Sen. Hatch’s question quoted above was a deliberate softball, setting up a subsequent statement supportive of Zuckerberg. 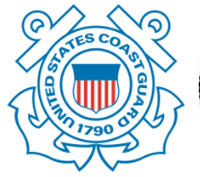 Perhaps the USCG can use their defective storage array as a…boat anchor? I’m sure the folks at Epic were up all night deliberating that one. Good luck Cerner! See you in the Zuckerberg seat!